The holidays are here and so are the holiday parties! While you may have already stocked your closet full of ensembles that will help you feel festive, you may also be desiring something that adds a little sparkle and will help you stand out this season. If you are like me, monochromatic outfits of black are the go to. For a night out I usually dress up my look with a statement necklace; and while I like the easiness of this, style should be evolving so it is always good to try new things. Instead of the usual outfits, try switching things up with a little bling – think sequins. I know, I know. You are probably thinking that you will look like a disco ball, but if styled correctly sequins can look less Liberace and more effortless chic. This season, many retailers have embellished their lines with sequins. You can find sequins in a variety of shapes, transparencies, and colors. Blazers and mini dresses have been donning the trend for several seasons; and now headbands, shoes, bags, and even sweatshirts are showing more glitz. While there are countless pieces to choose from, I have rounded up a few of my favorites from some of my go-to stores. Each of these pieces is something I personally would wear, have versatility, and range in a variety of price points. If you are interested in this trend, try picking a piece such as a top or sweater and pair it with jeans or leggings. If you opt for a sequin skirt, dress it down with a solid sweater or t-shirt. The juxtaposition of sparkle with plain items looks effortless and fashion forward. Also, try to opt for pieces in neutral colors. Navy, cream, and black are always good options and will have more longevity in your closet. What is even better, is you probably already have a plain bottom or top in the same hue that could be paired for an elevated monochromatic outfit, allowing you to splurge on one pricier piece or several more affordable ones! 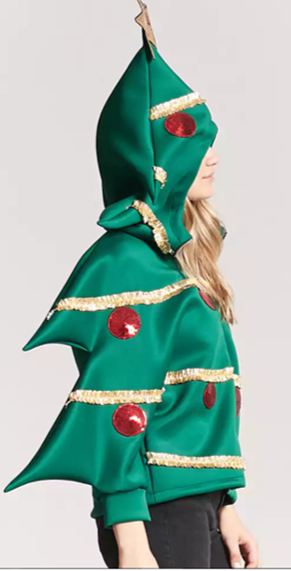 …And if none of these are up your alley, then embrace the “Ugly Christmas Sweater” trend with this cute hoodie from Forever21. You’ll be in theme, cute, and warm – and all for less than $40. Happy Easter • Passover • Spring - to every🐰 ! Bright colors to compliment a sunny disposition; and to brighten up a rainy day. Hi new friend 👋🏼 // After searching high and low, I settled on this guy as my summer bag. While a pricier one may out last time, for my purposes and it being a trend I wanted to try out, this one from Amazon seemed the way to go. Sometimes we sit in our drive way and have dance parties to the radio before we head inside. Yesterday our dance party included checking out her birthday trees and their fledgling buds through the sun roof 💛 Side note: how is she almost four?!? !